The Thunderbolt is Reminton's most popular 22 LR cartridge. 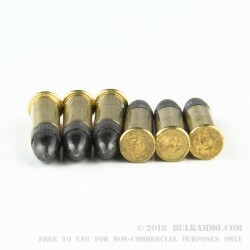 With its lead nose round tip, this new manufactured ammunition is popular with customers for range training and plinking. These 40 grain rounds will cycle through semi-automatics easily, and have a velocity of 1255 feet per second. This product is a brick of 500 rounds, with 10 boxes of 50 rounds. 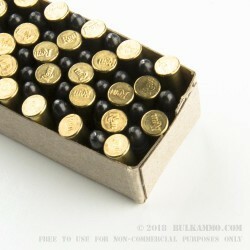 I have used this ammo for years in various guns, mainly for short range practice. Lead fouling is a concern, as you would expect with a LRN bullet. There is also more powder residue than I would like. I clean my guns after every outing, no matter what (former Marine); so these issues are manageable for me. The accuracy that I am getting is OK, with consistent 1" groups at 25 yards (offhand pistol - slow fire). That is about as good as my eyes can focus, at age 63, using open sights. I shoot a HS Victor and a Ruger Single Ten. Both, would prefer CCI Velocitor, Stinger, or Mini-Mag. All three shoot better groups. But, in this economy, Thunderbolts are doing OK. 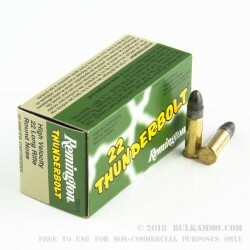 The Remington Thunderbolt .22 ammo is good value for the money. It generally fires well, seems pretty true to aim, and works. I only had one or two failures to eject, and no failures to fire from the 500 ordered. 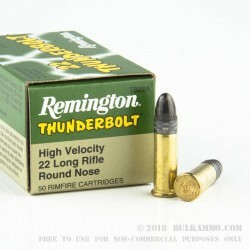 A: This Remington Thunderbolt 22LR ammo has a muzzle velocity of 1255 feet per second.